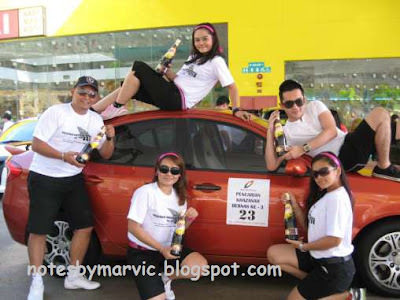 Last Saturday, 16th October 2010, BERNAS organizing Treasure Hunt program from Kepong to Cherating, Pahang. As usual, my team joined with me as Pilot, Erince as Co-Pilot and Indra with CK as our Treasure Hunter. Driving black colour BLM Saga, we drove our way according to the map given and tried to answer all 60 question. Our journey was so challenging as we drive around Temerloh more than 7 times and still did not get the answer and then again in Kuantan, we were mind-challenged with the tulips given. I bet the car that i was driving will receive summons love letter from JPJ. Making an illegal turning at traffic light, drive reversed the car for 500 meter, and not to mention driving fast like F3 driver from Kuantan, along Jalan Beserah towards Kuala Terengganu. It was so tiring for me as the driver and still had our girls fun making jokes about other team. We only managed to get 52 points at place no.31 out of 55 cars. The result was not pleasing as our team was among Top 10 in BERNAS Treasure Hunt to Teluk Batik, Perak, year 2008.
anyway..CONGRATULATIONS utk team kita yg mantop!